Li Tingting is interviewed by members of the media during the Occupy Men’s Room demonstration in 2012. Excerpted from China’s Millennials: The Want Generation by Eric Fish, Rowman & Littlefield, forthcoming June 2015. It is probably fair to say no woman has ever taken more flak for walking into a men’s room than Li Tingting. The two events were small and cheeky, causing no more trouble than a little embarrassment for a few men. Most onlookers just laughed it off and expressed support for the cause. Li Tingting did not figure that her action could draw the wrath of authorities. She could not have been more wrong. When I met Li a year after her “Occupy” movement, I could not help but find it amusing that she had been considered a threat by China’s vast “stability maintenance” apparatus. Whether the petite 24-year-old was recounting one of her quirky demonstrations or the childhood beatings she had endured, she ended nearly every thought with a mischievous giggle. Li was born in the rural outskirts of Beijing. She described her mother as a sweet and caring woman who had endured pain her entire life. Her father, on the other hand, she labeled a stubborn chauvinist. According to Li, her parents had been forced to marry young after becoming pregnant with her. As a child, her father delivered fertilizer for a farming company, but he was exceptionally unpopular with his colleagues. He had narrowly failed the gaokao college entrance exam after high school and remained perpetually bitter about the peasant’s existence to which that failure had relegated him. So when his company had to start laying off workers, he was one of the first to go. A few years later, he was offered his job back, but he was too proud to accept. Li’s mother picked up the slack, moving to a distant part of Beijing to work in a factory. Though she was bringing in the money and even continued to do the housework when she was home, her husband remained firmly in charge. His orders were non-negotiable and any affront by his wife or daughter resulted in a beating. Li remembered getting thrashings for things as simple as writing with her left hand rather than her right. The girls frequently rallied against domestic violence, which is rampant in China. In one survey conducted by Beijing Forestry University and the Anti-Domestic Violence Network, half of Chinese men admitted to violence against their partners. On Valentine’s Day 2012, Li and two other volunteers decided to call attention to the problem of domestic violence by wearing bridal gowns splattered with red paint to resemble blood. They marched down a crowded Beijing shopping street, holding signs and chanting slogans like “Love is not an excuse for violence.” They jokingly chided couples holding hands, warning them to be vigilant against abuse. As they marched down the street, they were confronted by chengguan (urban management officials) warning that they had not registered their three-person demonstration. The officers followed the women until they left. Most people did see the humor. After the first event in Guangzhou, the movement went viral on Weibo and started getting international attention. By the time the Beijing demonstration rolled around a week later, it was a media circus involving nearly every major domestic and foreign news outlet in the city. Li gave interviews under her “Li Maizi” public pseudonym, hoping that anonymity would keep her under the radar. It did not. Perhaps it was all the foreign media attention focused on China’s gender issues. Perhaps it was bad timing, as the National People’s Congress would meet the following week. Or perhaps Li’s ability to organize large groups for public demonstrations seemed threatening. She still is not completely sure why, but the Beijing event introduced her to the suffocating grip of China’s “stability maintenance” apparatus. “Stability maintenance” euphemistically refers to the country’s vast internal security network, tasked with stamping out any hint of potential unrest. It includes multiple agencies and thousands of offices overseeing surveillance, censorship, police, special informants, community volunteers, and even contract thugs. Since 2010, spending on the system has outstripped the country’s entire military budget. The day of the Beijing “Occupy” performance, the propaganda department sent directives for media to stop covering the moment. Then immediately after the demonstration, two plainclothes men escorted Li to their unmarked car. Only their badges, without names or numbers, identified them as police. Li’s father had always pushed her to try entering civil service and was disappointed and humiliated when she instead delved into feminist causes. But somehow, she now had a shortcut to his dream dangling right in front of her. After living a simple rural life for so long, he yearned to see his daughter enter the Golden Rice Bowl and improve the family’s fortunes. But Li did not bite. She continued giving interviews and kept posting on Weibo, so authorities stepped up the pressure. They showed up again and took her to their car, but there was no fancy dinner this time; just a brief session of “good cop, bad cop.” They told her that defying their orders constituted a betrayal of “trust between friends.” They also wined and dined her father a few more times, but it became clear that he had no power over her. She was already planning the next demonstration. 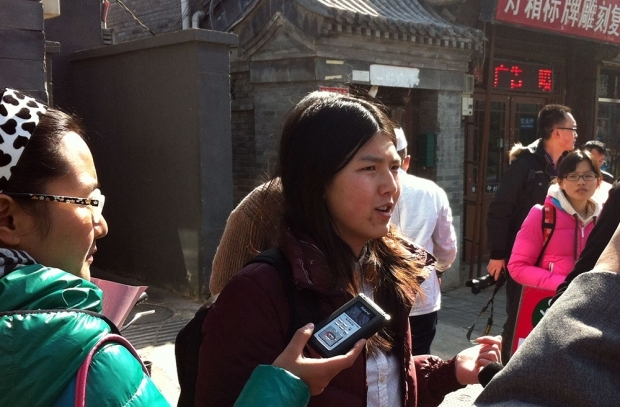 For Women’s Day on March 8, 2012 she and her volunteers slated an action in front of a Beijing government building in opposition to invasive gynecological exams that female civil service applicants were forced to undergo. This time, though, the authorities were one step ahead of her. On the day when the demonstration was to happen, Li phoned a friend to make final preparations. Within half an hour, police showed up at her door. She would later realize that they had tapped her phone and hacked her email. But by this point, the harassment was finally starting to wear on her. She made a calculated decision to retreat to Xi’an, then continue her demonstrations in the more open-minded city of Guangzhou until the heat was off in Beijing. In an earlier era, a rabble-rouser like Li Tingting could have been dealt with easily enough. The state could have held her entire future ransom, or simply scared her straight by dispatching her to a labor camp for a few years. But in today’s information age, Li’s network gave her a measure of security. Still, the “Occupy” experience gave Li a stark reminder that she could push the envelope only so far. If political winds shifted or she somehow crossed a line and the Communist Party felt that its legitimacy had been questioned, it would not hesitate to bring the hammer down hard. China’s labor camps and prisons house dozens of activists just as influential as Li who focused their efforts on more sensitive goals like democracy, Tibetan autonomy, or recognition for Falun Gong. Contrary to most of the young people it governs, the CCP has been slow to embrace the rapidly emerging diversity in China. While uneasiness over the organizational power of non-governmental organizations (NGOs) is one reason why groups like Li’s get harassed, there is a bit more to the story. Wei added that China’s feminist movement in particular suffers because China’s elder male leaders are uncomfortable with gender issues. Among the 204 leaders on the Communist Party’s all-powerful Central Committee, only 10 were women as of 2014. In the same way that feminism challenges the traditional patriarchal culture of China, Wei’s fight for lesbian, gay, bisexual, and transgender (LGBT) rights challenges the country’s traditional family structure. For Li Tingting, both issues are near and dear to her heart and, in fact, closely linked to one another. By the time Li entered college, homosexuality’s social stigma had subsided enough that she fully embraced her sexuality and came out to everyone—except her parents. While homosexuality does not face the same degree of religious opposition in China as in many Western countries, it can be considered an affront to the Confucian notion of filial piety and continuing one’s family line. Failing to marry and bear offspring in China is viewed as a slap in the face to one’s parents. As with many social issues, the disparity in attitudes between older and younger generations can present just as big a barrier to progress as government resistance. Indeed, the two factors tend to be intertwined. Xin Ying, a 27-year-old lesbian from Wuhan and Program Director of the Beijing LGBT Center, explained to me how this dynamic played out in her own family. She was active in high-profile public stunts to raise awareness for LGBT and gender issues, including “Occupy Men’s Room.” But the demonstration that got her the most attention occurred when she invited reporters to watch as she and her girlfriend attempted to register for marriage at Beijing’s Civil Affairs Bureau (where she was denied). After a picture of the couple kissing outside the bureau was splashed across newspapers, several family friends quietly mentioned it to her mother. “My mom said, ‘You want me to go crazy! Why do you do such a disgusting thing?’” Xin recalled. However, nobody dared say anything to the family’s patriarch. Ying’s father was still under the impression that she was working for an environmental NGO. Despite all her high-profile advocacy for LGBT rights, she still could not discuss her sexuality directly with him. “Maybe when I become stronger, I can come out to him,” she said. Though homosexuality has been perfectly acceptable on paper for more than a decade, authorities have continued to crack down on LGBT film festivals, parades, and clubs while censoring depictions of homosexuals in entertainment. The country has yet to enact an anti-discrimination law protecting LGBT individuals, let alone put gay marriage up for debate in the National People’s Congress. In 2013, police in the central city of Changsha went so far as to throw a 19-year-old activist in jail for 12 days after he led a street rally against homophobia. Ironically, the government’s attempt to maintain the status quo may be causing more harm than good to “family stability.” Because of the intense social pressure to marry and bear children, Chinese homosexuals overwhelmingly enter heterosexual marriages. A University of Shanghai sexologist estimated that as many as 90 percent of gay Chinese men marry unsuspecting straight women (compared to 15 to 20 percent in the U.S.). Media periodically report disasters sprouting from these loveless and sexless marriages, ranging from bitter divorces to suicide. Many Chinese homosexuals have begun sidestepping these problems through “cooperative marriages,” in which a gay man marries a lesbian with the understanding that it is all an act for the sake of family and career. This practice started gaining rapid popularity in the early 2010s, with matchmaking websites emerging to accommodate them. But these arrangements have their own problems—such as whether to have a child and how the family assets are divided—that tend to place a heavier burden on the woman. And even in these sham marriages, domestic abuse still occurs. This is one reason why Li Tingting chose to focus primarily on women’s rights. While LGBT issues are a major concern for her, she felt that gay men had greater political advantages. For example, they have been able to piggyback on the less sensitive HIV/AIDS prevention movement to get media attention and face time with government officials. Lesbians, however, have few avenues to raise their voice and even feel disrespected by male gay-rights activists. “I realized that if gender discrimination can’t be wiped out in China, then there’s no lesbian movement,” Li said. Like Xin Ying, Li was very hesitant to reveal her sexuality to her family. She finally worked up the nerve to tell her mother during college and was relieved to learn that she had already known for a decade. Her father was less accepting, though. He found out when documentary filmmakers accidentally let the secret slip while shooting at their home. Policy was indeed changing. It is impossible to know how much the changes are the result of campaigns like Li’s, but it is hard to discount the connection. Soon after the “Occupy Men’s Room” protests, several major city governments began suggesting (and in some cases even legislating) that new buildings have more toilet facilities for women than for men. Then, after the feminist volunteers targeted companies responsible for job advertisements that discriminated against women, several were fined by the Beijing government. These successes motivated Li more than “stability maintenance” discouraged her. A few weeks before I met her in 2013, the Sichuan Supreme Court in Chengdu had upheld the death sentence for a woman who had killed her husband during a beating session after years of abuse at his hands. Li and the volunteers organized a petition to stop the execution and were even so bold as to protest outside the courthouse. But always mindful of the need to be strategic, they demonstrated on a day when court was not in session and police were not on hand. In the end, the execution was quietly cancelled and the following year the sentence was completely overturned in a landmark case. While the Communist Party once appeared to be an omnipresent and all-powerful monolith, young people pushing for social change today have little memory of the bloodshed in Tiananmen. And today they are finding strength in numbers online. These changes have made authorities seem a more vulnerable, though certainly still formidable, force to contend with. Youth activists are finding that when pushing for particular social changes, they sometimes get their wish rather than a prison sentence. Li points to worries that the government might use violence on students again if it felt threatened. The conformist education that numbs Chinese to activism is another problem. To express a different opinion is risky; to actively organize others to protest on behalf of that opinion is downright dangerous with little tangible benefit.